The mega-merchandisers behind the Star Wars tie-in empire have not yet begun to toy, according to a fine behind-the-scenes feature by Michael Grothaus in Co Design. The post takes us inside the forcefield at the Hasbro compound with the company’s Star Wars Design Director Steve Evans. The designer details the secrecy which shrouds toy development from the masses. He’s one of very few people allowed to know what’s actually going to happen in the forthcoming The Force Awakens—mostly. Matter of fact, if you thought you had seen all The Force Awakens merchandise previewed on Force Friday, think again. While dozens of new action figures were shown off, those were carefully selected to be only from the first third of the film so as to not give away anything which hasn’t been already seen in the trailers. Perhaps that’s not so surprising, given the paranoia with which Lucasfilm guards the story. Indeed, when we spoke to the creators behind the Sphero BB-8 smartphone controlled droid, we were told that the designers had yet to build out much of the functionality the toy would eventually have, simply because they’re not privy to what actually happens in the movie. As the company learns more, they can build out more features. 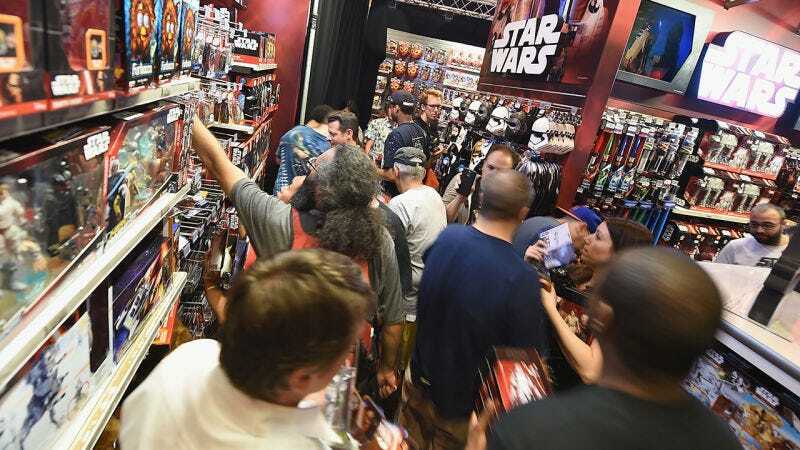 Depending on whether you love or hate Star Wars toys and merchandising in general, you may not be thrilled at the prospect of even more material clutter related to the imaginary science fiction universe. Either way, the Force will generate billions and billions in revenue in the coming months. Make sure you check out the whole post for some lovely Star Wars design pron.